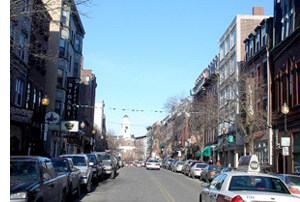 Boston’s North End: No Time, No Reservations, No Worries! After paying your fare, you slide out of your cab and embark down the famous Hanover Street in Boston’s version of Europe — the North End. Paul Revere stoically sits atop his horse in front of the Old North Church, commemorating his famous ride. The smell of garlic sautéed in exotic olive oils floats out of the doorways of the restaurants you pass. Every on-street parking spot is taken, cars with their hazard lights blinking are double-parked everywhere, and valets are busy whisking even more cars away. Your time in the North End is extremely limited; maybe you have tickets to tonight’s Celtics game, free time between meetings, or a few hours before catching your plane at Logan. Whatever the case may be, you only have a couple of hours to grab a drink, eat a quick meal, and taste one of the best cannolis this side of the Atlantic. With little time and no reservations, selecting which door to walk through is a rather daunting task. And be forewarned: the only method of payment in the majority of businesses here is cash. DRINKS: For an extensive wine menu or a martini, enter the Florentine Café. While sitting at the marble-tiled bar you will quickly notice the detailed woodworking that houses a collection of top-shelf liqueurs.. Here, the Dirty Martini is served with three plump, fresh green olives and ice crystals rising to the top. EATS: For one of the best Italian meals of your life, head to Giacomo’s. Don’t worry about not having reservations: they don’t accept them. But if you try to eat there on a Friday or Saturday night, you may wait in line outside forever. The trick to Giacomo’s is to get there right when it opens (Mon.-Sat. 5pm, Sun. 4pm), if not a few minutes early, to ensure you get a table during the initial seating. If you time it right, you will be in and out in under an hour. Don’t expect soft candle light and romantic Sinatra here — the wait staff is on you to put in your order shortly after you’re seated and orders are often shouted across the dining room to the frenetic kitchen in the back. To get started quickly, try the fried calamari. The light spice and vinegar imparted by the banana peppers is a perfect complement to the mildness of the calamari. Both are lightly battered and fried to a crispy perfection and served with a side of marinara. If you see the spinach and ricotta ravioli in a red sauce with chicken and prosciutto on the specials board, consider yourself lucky. The prosciutto adds a nice touch of saltiness to the delicate taste of the ravioli, while the chicken adds substance. If you don’t want to go for the daily special, the butternut squash ravioli and chicken parmesan are two dishes on the regular menu that never disappoint. SWEETS: The debate over who makes a better cannoli, Mike’s Pastry or Modern Pastry, is similar to the debate in Philadelphia of who makes a better cheesesteak. The crunchy, candied shell of the Florentine cannoli from Mike’s has no equal. When comparing a regular cannoli from both bakeries, it is quickly apparent that the cannoli from Mike’s is about 20% larger. The size alone doesn’t make it better, but seeing as you get more smooth, rich ricotta filling for your dollar, Mike’s is the way to go. By now it is probably time for you to head out. Hopefully you had a remarkable visit to Boston’s historic North End, and you may even have a box of cannolis to share with your friends as proof!